eBay Australia and Myer team up to take shoppers on a virtual department store journey. This article was originally published in our executive journal, Customer Strategist. Click here to see the latest issue. In the world of e-commerce, May 19, 2016, could be considered a milestone. This is the date that the first major virtual reality department store opened, as a partnership between eBay Australia and Melbourne-based retailer Myer. Myer, one of Australia’s largest retail chains, has been around since 1900 and is known as an iconic Australian brand, with 67 stores and billions in annual sales. eBay, meanwhile, is trying to shed the perception of a second-hand auction house in favour of a leading-edge technology e-commerce platform. Shoppers download an app to access the store. Using branded Google Cardboard goggles called “shopticals,” or other VR headsets, shoppers can choose from among 12,500 items with their eyes, and can zoom in and around items in virtual 3D. According to the companies, the site gets more personalised as it remembers your behavior and purchase history each time you visit, customizing each shopper’s experience. eBay Australia Senior Director of Marketing and Retail Innovation Steve Brennen recently dicussed the initiative and what virtual reality means for the future of retail. Customer Strategist: Virtual reality is a nascent platform in retail. Why is it an important technology for eBay to enhance its business? Steve Brennen: Perception of the eBay brand as a place for new, fixed- price items was lagging behind the reality, with some customers still thinking of eBay as an auction house of the past. In reality, 90 percent of our inventory is new and from big-name retailers. 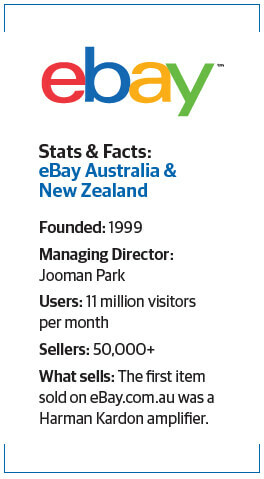 This is a strong message we’re continuing to communicate to eBay Australia shoppers. We can see the potential transformative effects that VR could have on retail and also know that consumers are particularly keen to be a part of this technological journey. Sales of VR headsets on eBay tell us that Australians are ready for this new technology and the first half of the year has already seen tens of thousands of VR headsets sold in the country. By observing the reactions of thousands of Aussies who try the experience, we have the opportunity to take those learnings and lead the world into the next phase of technology enhanced retailing. CS: How did you come to partner with Myer? What are the goals of the partnership? SB: Myer have recently joined with eBay as part of their commitment to omnichannel retailing. We have found that we share similar thinking when it comes to innovating around the needs of customers. We know Australians in particular are enamored by emerging technologies, are already buying up big in the VR category, and are ready for new experiences. It made sense to combine our technology with Myer’s amazing product range to make this experience as compelling and inspiring as possible for Aussie shoppers all over the country. CS: What is the shopping experience like for the consumer? SB: We challenged ourselves to not just replicate the current shopping experience in VR, but instead we removed the boundaries that we are faced with today in both online and offline retail. This allowed us to focus on improving things such as browsing, merchandising, personalization, and efficiency. As a shopper, just entering the store is an experience in itself. You really get the feeling you are being transported into a whole new world, a whole new way of looking at things. Once you’ve downloaded the app (which has been built for both iOS and Android) there are four steps to take within the store itself—personalise, browse, research, and then add to basket to purchase—a complete interactive experience. A truly stand-out feature of the experience is that customers are given the opportunity to be totally confident about the items they are purchasing, because the technology bridges the ‘trust gap’ so customers know that what [is presented] is what they receive. The eBay Department Store has allowed us to learn more about Australian consumer behaviors, in particular their shopping preferences. It’s been interesting to be able to see how people maneuver through the VR store, what they like and what they don’t, and how we can merchandise differently to them for a more streamlined shopping experience. What we know is personalization is proving to be key to any positive customer experience. CS: Are you using VR only for shopping, or are you doing anything with customer service or other areas of the business too? SB: For us this was all about giving Australians a glimpse into the future of the possibilities of how shopping could be. We have used the experience to closely examine our shoppers’ behaviors and learn what they like and don’t within the VR experience. We are always looking at ways to challenge ourselves to improve the buying or selling experience for our customers, including using new technologies to improve efficiencies. CS: The initiative involves a proprietary program called eBay Sight Search. Can you explain the technology? SB: We researched the behavioural science behind shopping, and honed in on an insight revealing how the human brain processes large quantities of information using patterns in the real world. Taking this insight we developed a custom physics engine and VR navigation system called Sight Search, allowing users to browse, sort, and purchase over 12,500 products using just their eyes. Complex relationship algorithms allowed users to spawn related items by looking at products. We then integrated directly into the eBay platform APIs, pulling in real-time data including price, inventory levels, and product data. CS: Is it available across other geographies? SB: The eBay Myer World’s First Virtual Reality Department Store app is only available to Australia at this stage. CS: What’s the current state of the VR store? Who’s visiting and shopping, and how is it performing? SB: The launch of the Virtual Reality Department Store has been an incredible journey. We continue to be overwhelmed with the interest and engagement around what shopping could look like in the not-too-distant future. On the day of launch, the VR store had more than 8,000 unique visits to the microsite by 7 a.m. And 4,000 people downloaded the app on the first day, growing to 117,777 unique users by June 2016. The feedback has been incredibly positive. And by observing the reactions of thousands of Aussies who try the experience, we now have the opportunity to take those learnings and lead the world into the next phase of retailing. We are excited about the next chapter and can definitely see the potential transformative effects that VR could have on retail. We also know that consumers are particularly keen to get their hands on this technology. At eBay we are always challenging ourselves to do new brave things that enhance the shopping experience, and as part of this we are always exploring new technologies and new partnerships. CS: What part of the initiative are you most proud of? SB: Utilizing an innovative technology tool, virtual reality, to launch a world first for eBay Australia. I think it would have been easy for us to sit back and wait for others to have done this first. Being first to the market with such a product was extremely challenging, but we are so proud we got there in the end. CS: What advice do you have for other executives looking to use virtual reality? SB: Allow yourself to dream about the possibilities in your industry. Challenge yourself and your teams to think about how you could do things differently if you didn’t have the boundaries we are tied to in the traditional world. If you don’t have in-house capabilities, then find a great partner and give it a go. The only way we will ever know the full potential of new innovations like VR is if brands are bold and brave. Until quite recently the potential of VR was only really understood in the entertainment and gaming industry, but as other industries start to branch out and explore the possibilities of VR, it gives the platform more credibility and gives brands confidence. The Virtual Reality Department Store could the first step on the road to making virtual reality a mainstream retail experience. I think retailers of all shapes and sizes should start experimenting with it and see where it leads them.